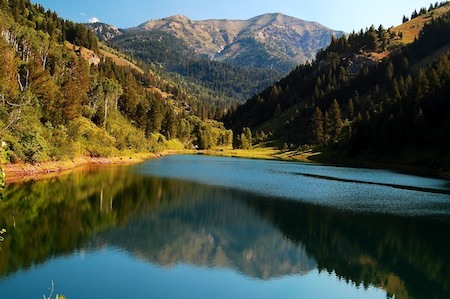 Early July, 2012 – After spending the 4th of July beachside at Bear Lake, Utah, amid jet skis and sailboats, we rolled north. The scenery changed gradually and no longer had that aura of waterplay and vacation. Old barns and big hay fields began to dominate the landscape. We pulled into Afton, Wyoming, and had to stop. 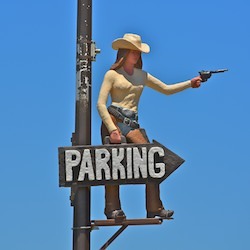 It’s not always easy to find a place to park a big long rig, but this town made it very clear exactly where the public parking was: a wooden cowgirl stood high up on a lamppost with a gun pointing the way. Of course, we found it easier just to park along the side of the road than to try to squeeze into a lot! 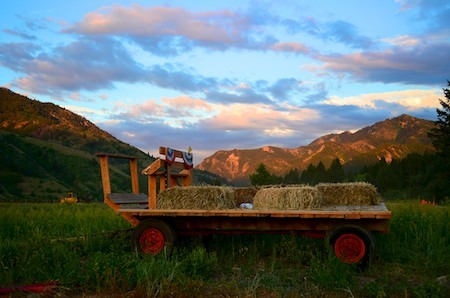 This is cowboy country, ranching country, and hunting country for sure. Elk shed their antlers every year, and there is such an overabundance of antlers lying around these parts that the locals get very creative finding ways to use them. 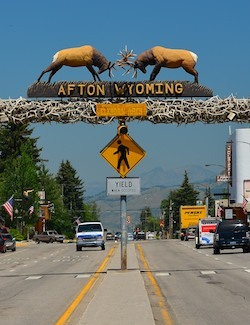 An arch made entirely of elk antlers crosses the main street with a sign on it saying, “Afton, Wyoming.” Above it two elk are butting heads. We ventured a little further north to find an overnight spot in tiny Alpine, Wyoming, where a wonderful sunset turned the mountains brilliant colors before fading. We woke in the morning to find a truck full of cattle had pulled in next to us overnight. The constant stomping and peeing of those cows made quite a racket, but it was the driver’s awesome handlebar mustache and hook where his hand had once been that got us grinning. The small towns along this route were all very cute. Alpine sits at the base of Palisades Lake, and as we drove along its eastern shore the next morning we discovered there is tons of wonderful boondocking along that shore. 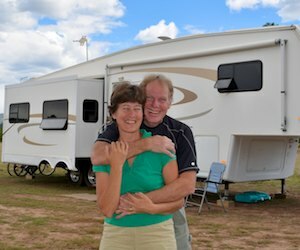 We stopped in one pullout to get some photos but kept on rolling, vowing to come back some day to check out the lakeside camping options. We were now flirting with the Wyoming and Idaho borders and decided to check out two more officially scenic drives: Idaho’s Teton Scenic Byway and Mesa Falls Scenic Byway.